Facebook is rolling out a new privacy settings checkup tool designed to give users a clearer picture of who can see their posts and other information they share. When they log on, Facebook users will get the option to go through the process, which reviews privacy settings for their posts, app log-in permissions and profile information, the company said Thursday. The tool will also be available on demand from the privacy shortcuts tab on the top right corner of users’ screens; it’s the icon with the security lock. 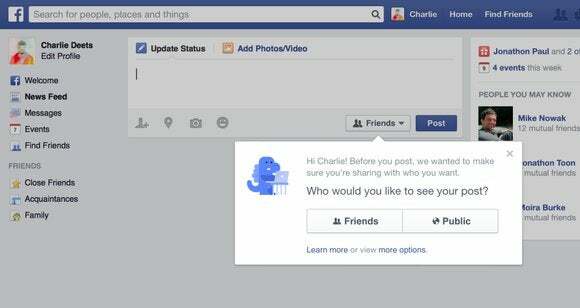 The tool is only available on the desktop, but a mobile version could come after Facebook gathers feedback. The tools available in the privacy checkup are not new. But they’re being presented in an easier to manage way compared to Facebook’s existing privacy settings page. The first stage of the checkup tells users who can see posts made from their news feed or profile, and lets them change the settings, like from public to friends only, for future posts. The next menu lets people see which apps they’ve logged into with Facebook. From there, users can change who sees posts made by the app, or delete individual apps from the list. Outside of the new tool, users can also change their app settings at any time through Facebook’s settings page. This streamlined menu for app permissions follows other changes Facebook made earlier this year giving people more control over the data they share with apps. Finally, the tool shows people information from their profile like where they work and live, and which schools they attended, and lets them manage who can see what. This menu may not show all of a profile’s information. Users can see the rest and make additional changes by visiting the “about section” of their profile.